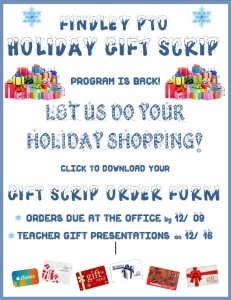 Findley’s Faculty and Staff Gift SCRIP Program is Back for the Holidays! Holiday gift giving can be a heartwarming experience. Teachers are grateful when parents appreciate their hard work with the kids. However, trying to find the perfect gift for everyone, while fighting holiday traffic can make us less than merry. Therefore, please consider using the Findley Gift Scrip program for the teachers and staff that keep our great school running! How does Gift Scrip Work? SCRIP program provides entertainment/restaurant/grocery store discounts to non-profits. Findley PTO raises funds with each order the staff makes . If you’ve misplaced your paper copy, just download and fill out the SCRIP – 2014 Parent Order Form with the gift dollar amount for any faculty/staff member you would like to recognize this holiday season. The gift amounts from all families will be combined into a total for each staff member. Download, print and fill out the SCRIP – 2014 Parent Order Form. You can submit one form per each of your kids, or combine all your children into one form. Just attach one check for the total amount. Drop off the form in an envelope marked ‘GIFT SCRIP’ at the office by Tuesday, Dec. 9th, 2014. That’s it. We will take care of the rest. Now the fun part! On December 16, 2014 staff will be presented with a letter naming their gift givers and a certificate stating the total dollar amount given to them to spend in Findley Gift Scrip. The dollar amount of your individual gift will never be listed. The faculty and staff members will order cards and certificates from 114 participating vendors like Fred Meyer, Bed Bath & Beyond, Pizzicato or iTunes. To learn more about SCRIP, please visit SCRIP Service Center website.